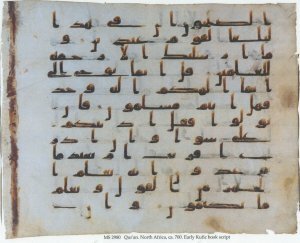 Description	 MS in Arabic on vellum, North Africa, ca. 700, i f 55x70 cm, single column (46x52 cm) 12 lines in early Kufic script without diacritical marks. 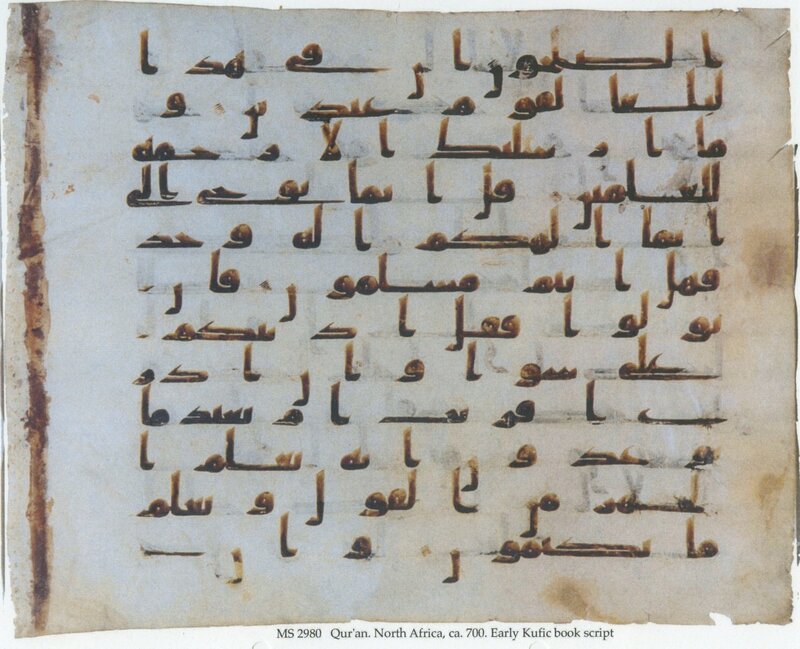 Context	 About 1/3 of this monumental Qur'an is housed in Tashkent in Uzbekistan. Provenance	 1. St. Petersburg Public Library (ca 1880-1905); Spinks, London (-1999); 3. Sam Fogg, London, March 2000; 4. De-accessioned to Sam Fogg, London June 2003. Commentary	 Radiocarbon dating in Oxford of the present leaf gave a date between 640 and 705 with 68% probability. Published	 A.F. Shebunin: Kuficheskij Koran Imperatorskoj Sankt-Peterburgsgo biblioteki, in: Zapiski Vostochnogo Otdeleni'a imperatorskogo russkogo arkheologiches kogo obshchestva, vol. 6 (1891) pp. 69-133.